It’s a Disney place name extraordinaire, and if you look hard enough, you might just find it on a map. 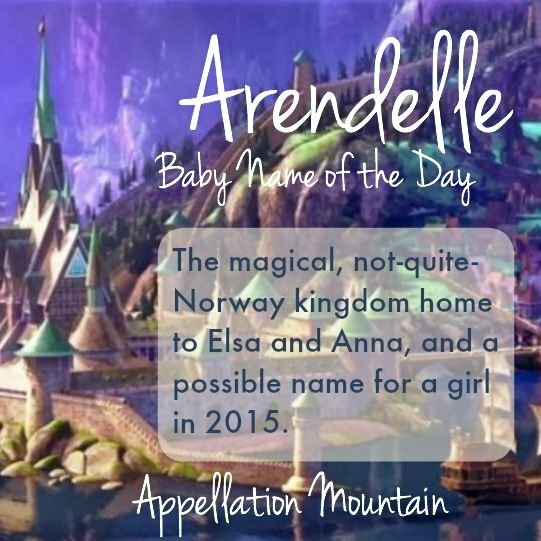 Thanks to Jennie for suggesting our Disney Baby Name of the Day: Arendelle. Quick, where does The Little Mermaid take place? I’d guess Denmark, but that’s thanks to the traditional story, not the movie itself. Beauty and the Beast is set in France – the singing candlestick tells us that. But it’s tough to pin down an exact location. We know the countries and time periods for Pocahontas and Mulan. 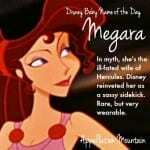 Tiana reigns in New Orleans, and Merida is from the Scottish Highlands. The look of those locations was dictated by reality. Frozen’s story was inspired by a traditional fairy tale by Danish writer Hans Christian Andersen, The Snow Queen. Disney could have created a fictional kingdom that was broadly Scandinavian. Instead, Arendelle is clearly inspired by Norway. So much so that Epcot’s Norwegian Pavilion is about to get a makeover to turn its Maelstrom ride into an Anna-Elsa-and-Olaf extravaganza. Adventures by Disney takes visitors to the Norwegian locations that inspired the movie’s animators. And so Arendelle is different from the places other Disney princesses call home – a place that is fictional and real at the same time. Adventures by Disney takes guests to Bryggen, a UNESCO World Heritage Site. Bryggen means “the wharf.” It’s part of modern-day Bergen, which remains a major center for shipping and other maritime businesses. The city was established way back in 1070, on Norway’s west coast. 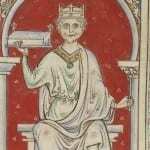 Back in the twelfth century, Bergen was briefly the capital of Norway, and saw a king crowned in its cathedral. More recently, it’s the site that Disney imagineers visited as inspiration for Elsa’s kingdom. So that’s the look of the movie, but how about the name? Arendelle may have been borrowed from a city on Norway’s southern coast. Arendal was founded in the 1500s, though it wasn’t officially incorporated for another two hundred years. 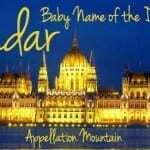 The name probably comes from arn – eagle – plus a word meaning valley or dale. Like Bergen, Arendal is also a port city. Nancy is tracking Arendelle as part of her annual Pop Culture Baby Name Game. Because the movie debuted late in 2013, it seemed likely that the first year we’d see data on Arendelle was 2014. But so far, it seems like Arendelle isn’t being used as a given name. 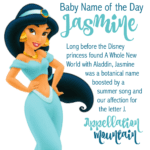 Arendelle sounds something like Isabelle or Gabrielle – popular girls’ names in recent years. We love names that start with the letter A. Aren reminds me of Erin, a name that was big in the 1980s, as well as Karen and company. Place names are huge. Brooklyn and London are real places, true. And yet, I think parents choose those names because they like the idea of those places. I’ve yet to meet anyone in Park Slope with a kid called Brooklyn. Lastly, Frozen is a sensation. It’s probably helped boost the name Elsa from obscure Elizabeth variant to fast-rising favorite. Why not Arendelle? Overall, Arendelle is a fanciful name. If Bay is too subtle, Arendelle is all Mouse Ears and magic. And yet, it has an appealing, romantic sound and might make a gorgeous middle – or a truly daring first. What’s your favorite Frozen baby name? 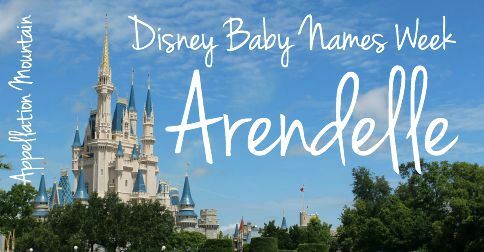 Would you consider Arendelle as a child’s name? I’m on the lookout for my first baby Arendelle. It’s not exactly my style, but I agree that it does sound namelike with the -elle ending and people do like placenames. Slightly reminds me of Araminta too, with the beginning and the length. Recently my daughter read a Penderwicks book (by Jeanne Birdsall) and a place mentioned right on the first page is Arundel. Slightly different vowel sound, but very similar. And it’s an actual place in the UK. The Arendelle spelling is a lot prettier though. If Avonlea can be a name so can Arendelle!